I will describe how to setup SSO for Workplace (by Facebook) with Keycloak as Identity provider. I deployed keycloak version 4.3.0-Final in a docker container using the “official” keycloak docker image : jboss/docker. On the workplace application, as admin, go to the “Admin panel” then navigate to the “Authentication” page. 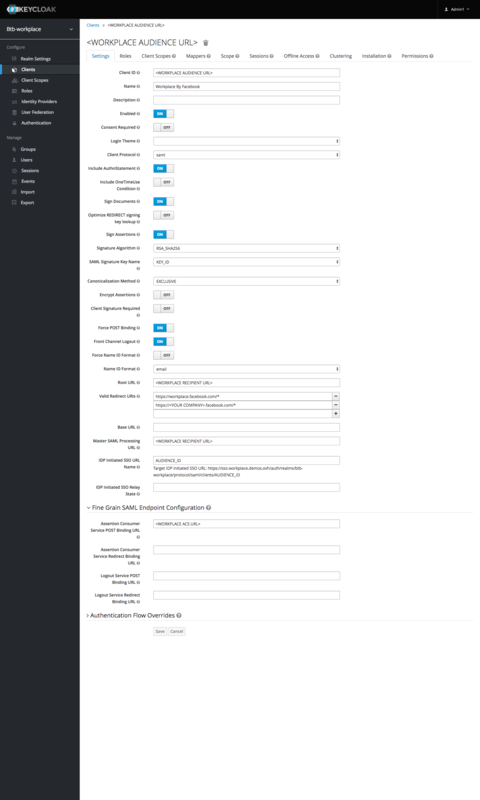 Then go to keycloak admin console to configure the client application. I assume that you have a realm configured. NOTE : You need to have a user in keycloak with the same email address used to connect to the admin panel of workplace (as it will be use to validate SSO configuration). SAML Certificate : The certificate string copied from the last step of keycloak configuration. Then Click on Test SSO. A popin should open, display the keycloak login form (if you are not already logged in), then display a message : SSO Authenticated. If a user is not created in workplace, when he trys to connect to workplace, workplace send him an email to verify the email address. If I create a user in Workplace, workplace send him an email to invite him to workplace, when he click on the link he is redirected to the SSO Login page, then once logged in, back to workplace, workplace ask him for a username.